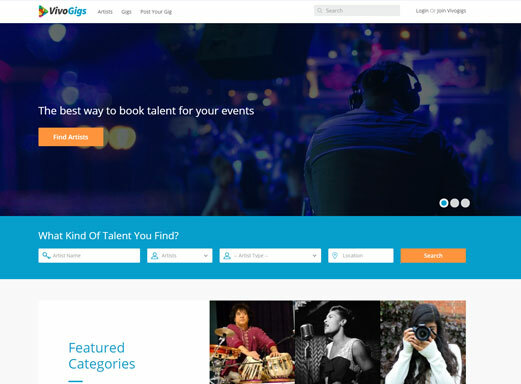 VivoGigs is a ready-made marketplace solution to build a website for performers and gigs. Artists can post their upcoming events so that event planners can check their availability. The easiest way for organizers and planners to find artists/bands as per their budget. Filter based search to fetch right search results, quickly and easily. Let your end users know whenever a new planner or artist registers, or when a gig is assigned. Transparent business communication while staying in the loop ensures healthy business practices. Connect with more artists and planners/organizers and also keep people updated with ongoing and future gigs. Help planners know what different clients have to say about them. Also, help artists find genuine clients. Launching your Online Gigs Marketplace doesn't get easier and more affordable than with VivoGigs. Get acquainted with the most powerful online gigs marketplace system to know how it will help you launch a successful business. Earliest date for the demo will be atleast 2 days later from the current working day. Demo can only be scheduled on working days i.e. Monday to Friday.